Twelve FRIAT (Friends of RIAT) members' festive activities have raised just under £2,000 for the Royal Air Force Charitable Trust, Jon Egging Trust and Royal British Legion. Nigel, Marion, Mark, Rob, Angela, Nick, Rachel, Mick, Ken, Wendy, Karen and Paul all took part in the charity fundraiser at the Air Tattoo last month. Explaining the idea behind the group charity event, Nick said: "We thought it would be good to meet outside of FRIAT at Christmas, but a plan never came together - that is until one of our lunatic brethren suggested bringing Christmas to Fairford! "We decided that we would each bring festive outfits and Christmas decorations to jazz up our tents - we've brought everything from Christmas trees to inflatable Santa's to a grotto!" 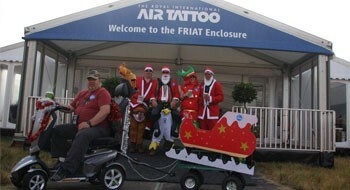 To drum up support and tempt people into entering their campsite raffle, the group attended this summer's Air Tattoo in festive outfits including a Santa and sleigh, reindeer and a snowman. "We've been turning people upside down for loose change and have generally made a nuisance of ourselves on the campsite much to everybody's amusement! "The looks that people gave us when they saw our Christmas grotto in 30 degree heat in a dusty Fairford field was really quite amusing". Other tomfoolery included attempting to squeeze into as many aircraft at the show as possible. "It was basically an excuse to see what we could get away with. It was a really good laugh, a lot of the crews realised as soon as they saw us", Nick chuckled. In total, £2,136 was raised for the three charities, including over £712 which was donated to the RAF Charitable Trust. When asked about their decision to donate to the Trust, Nick said: "Hello?! We're here! This is Fairford; this is what it's about! It would seem foolish not to collect for the main event charity. It's a gesture towards what we all care about. "The fundraiser has been great and the reaction on campsite has been brilliant. It's been hard work and a good laugh. We're just a group of friends who had a silly idea and went with it."